Today the sun made a welcome appearance in Yorkshire, so it was great to get out in the fresh air. These crisp, bright days remind me spring is just around the corner, but the cold nip in the air warns me not to pack away the winter woollies just yet. So I layered up! I really feel the cold and if I'm not careful I get numb fingers and toes...ouch! So I plan what to wear in winter very carefully. I need to keep warm, but still want to look chic. I love this layered outfit for keeping me toasty warm, and it's all high street too, seriously bargain'ista! A wool cape coat is a great way to cover up chunky winter jumpers, and the *only* way you can cover batwing jumpers. I'm sure we've all tried to squeeze a normal coat over baggy jumper sleeves...and been unable to move! Look for cape with a belt to give some shape, like the one I made last year in gray wool cashmere. I've tried and tested every way of keeping warm during a Yorkshire winter, and a hat is essential (and also stops your hair from flying around!). Longer length gloves which cover the wrist are a great help, the wrist area loses a lot of heat as the blood vessels are so near the surface. And last but not least, keep your feet warm and dry with wellies and thick fleece liners, Although the day was sunny and dry, the ground is still very wet, so I wore my new ruffled wellies...love them! 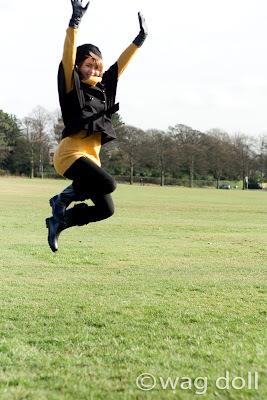 ...a few jumps (tuck jumps in wellies are hard!) 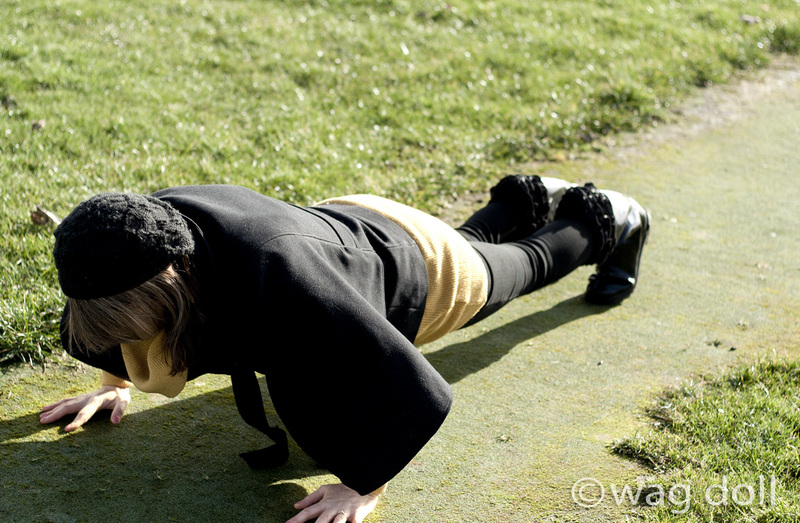 and even a burpee or two! And let me tell you....Tuck jumps and burpees are the quickest way to combat the cold! How cute are you? You are rocking that coat. I don't think I could pull off a cape coat. Aw thanks Vicky! And I bet you could, capes are so easy to wear. I need to stop my addiction to cape coats, including the one I made, I've now got 4 now LOL!